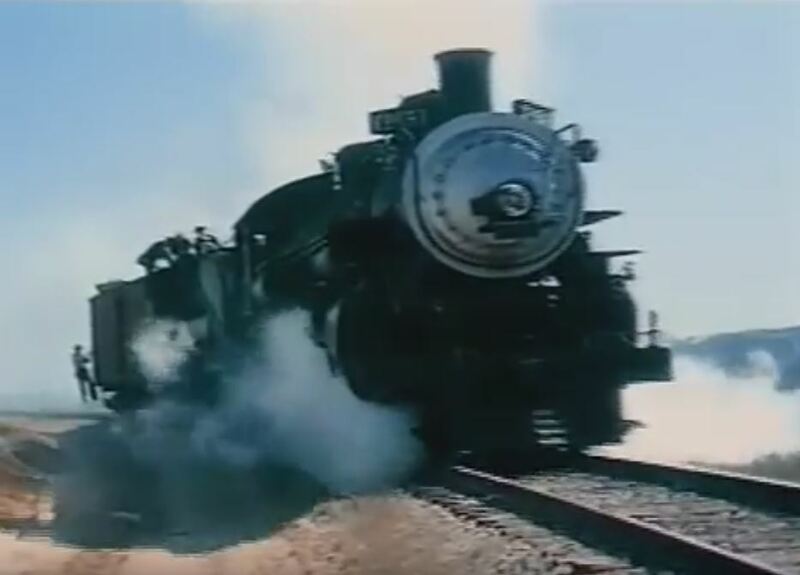 A case of insomnia at 2am led to me finding this train movie while channel-surfing around. 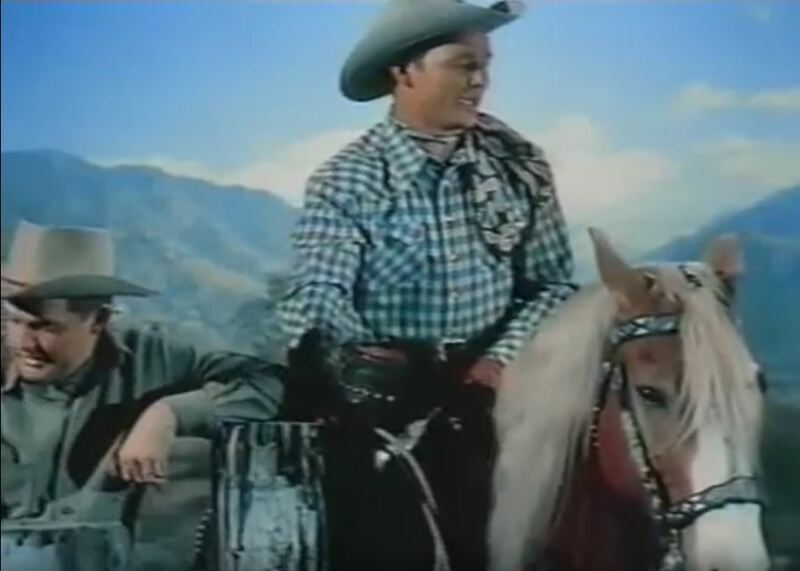 The star Roy Rogers was almost synonymous with the B western movie so popular in the 1940’s and 50’s. At just over an hour long, I was able to find a decent copy to view on YouTube. 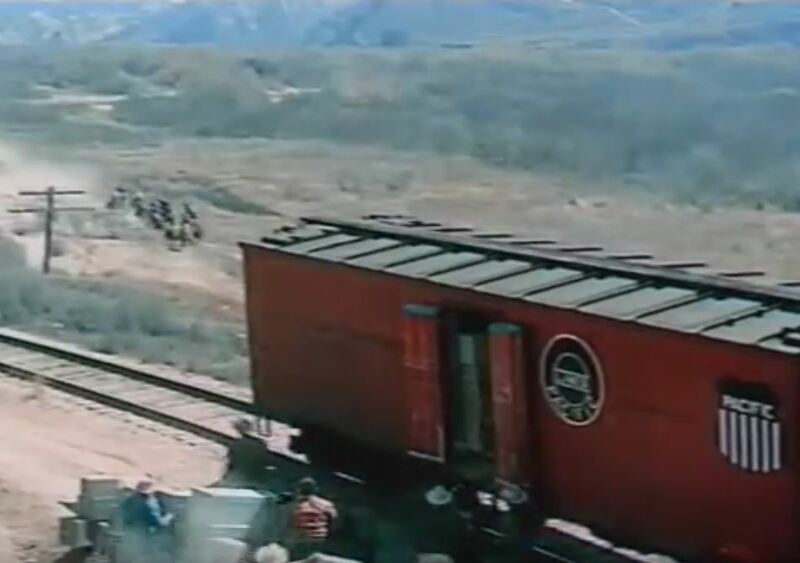 Briefly, the story is gun runners are hijacking trains on the Shore Line Railroad to transport their illicit cargo across the border. 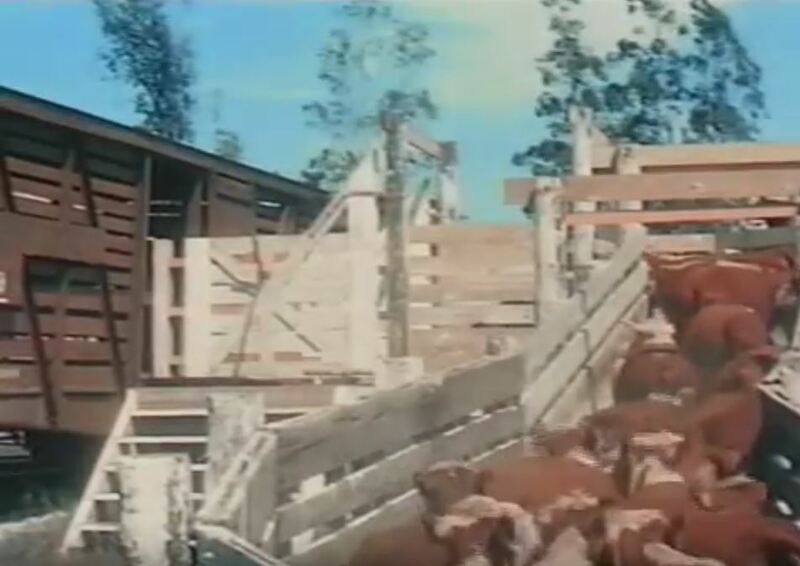 When a train fails to stop to load Roy’s herd of cattle, he starts to investigate and runs afoul of the smugglers. 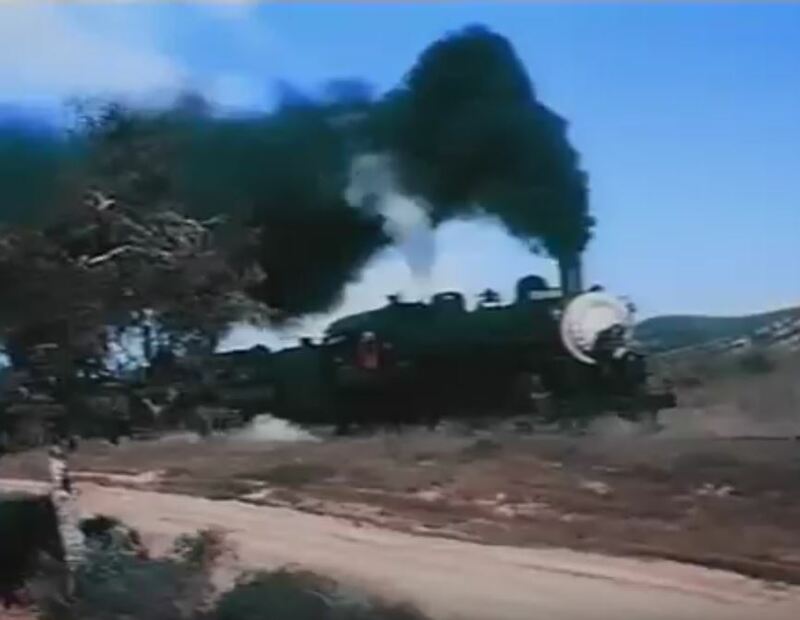 The train scenes feature Southern Pacific steam locomotives 3476, 1503 and 2651 (may just be one locomotive renumbered). 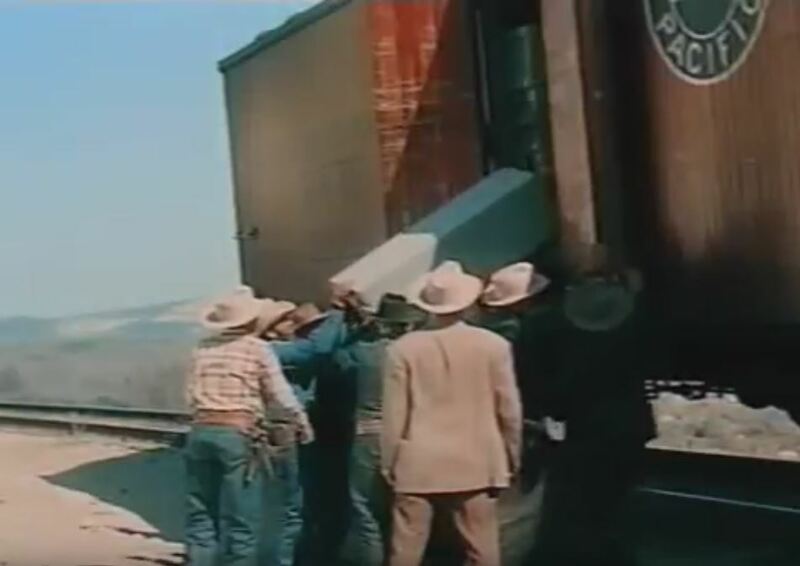 Oddly, the smugglers use a Pacific Fruit Express refrigerator car # 75119 — with its unique folding-open (rather than sliding) side door. 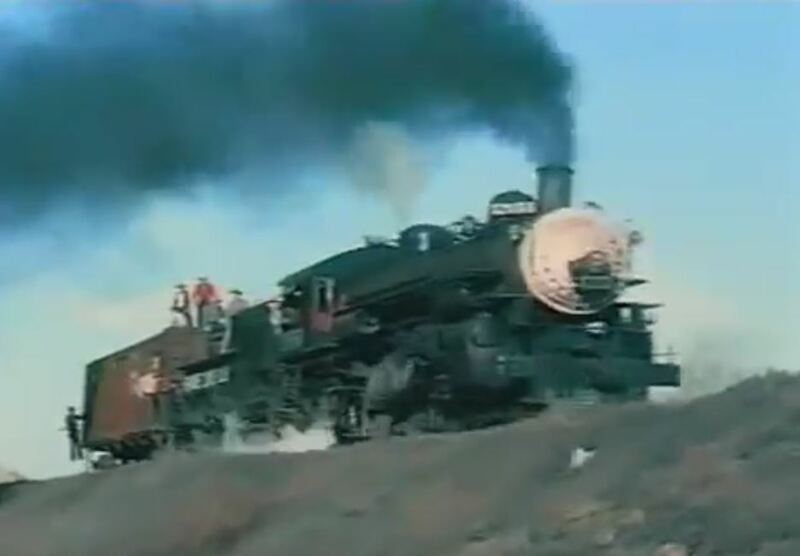 There are some terrific pacing shots of the SP engines at full gallop. All this in full color. Come take a look! 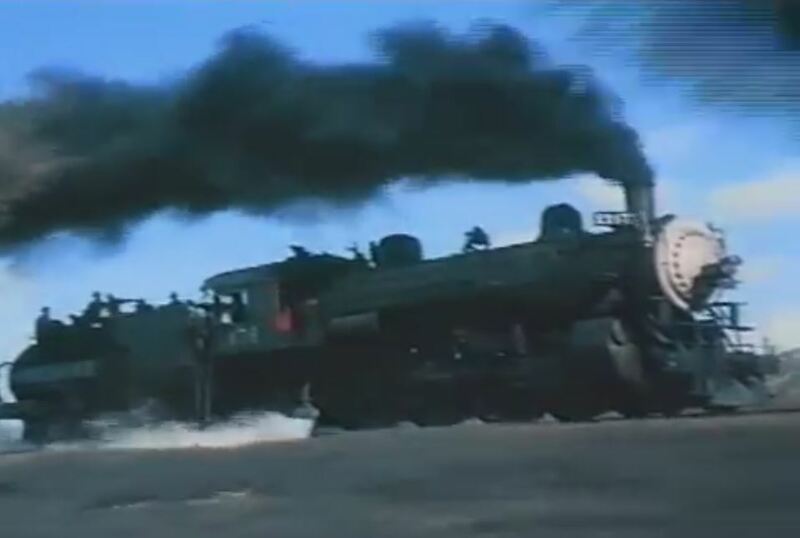 SP 2651 pulls PFE reefer 75119 as it races along with the bad guys aboard in a climactic scene. “Southern Pacifc Lines” on the tender has been carefully painted over with “Shore Line R.R.”. 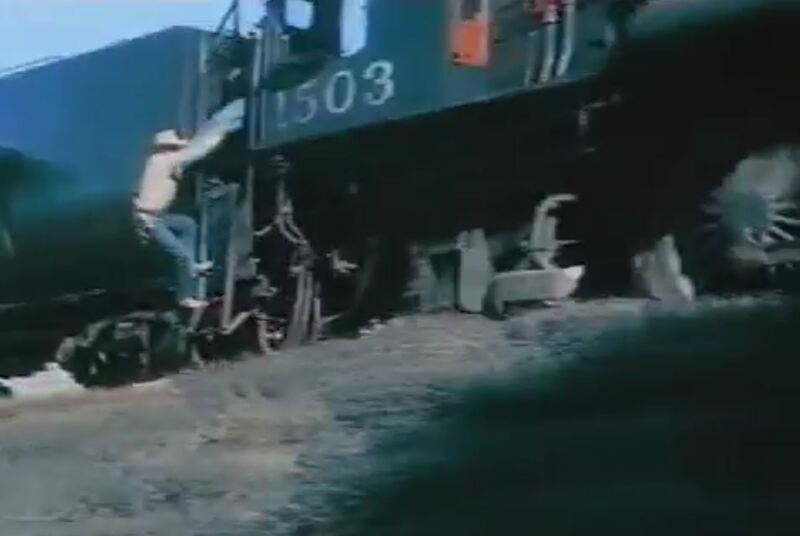 The picture opens with a rescue train in hot pursuit of another overdue train; In an engine cab mockup of SP 3476, Sheriff Tad Osborne (played by Will Wright) is investigating yet another train holdup. Sheriff Tad doesn’t have long to wait. 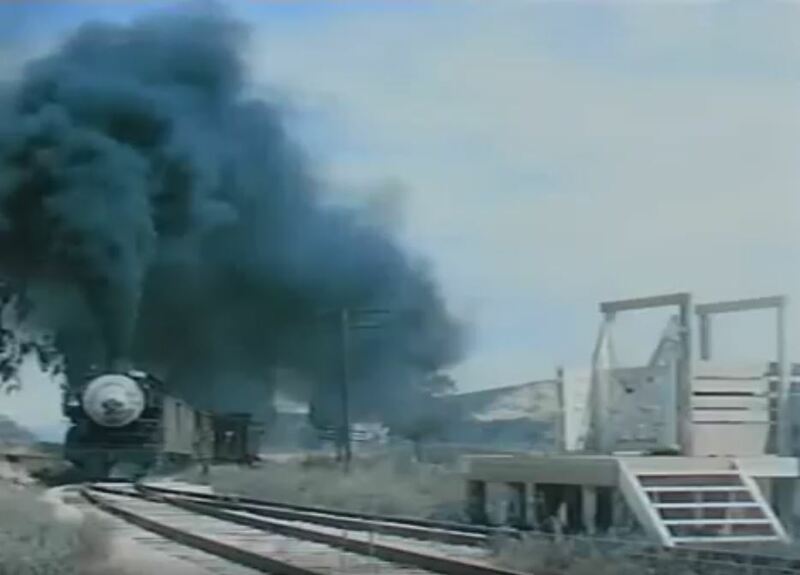 The cargo of this missing train is spewed all over the ground trackside. 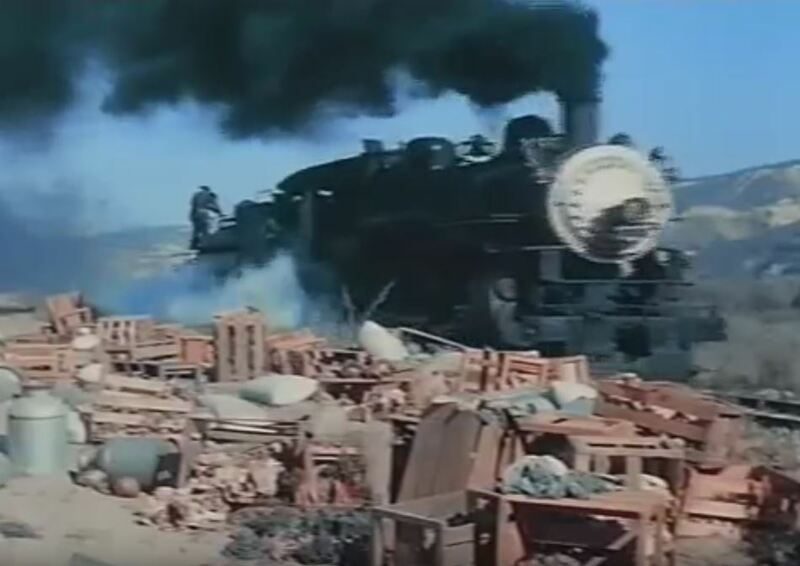 Just ahead, the bad guys race along in SP 1503 with the missing train (now loaded with their ammunition). 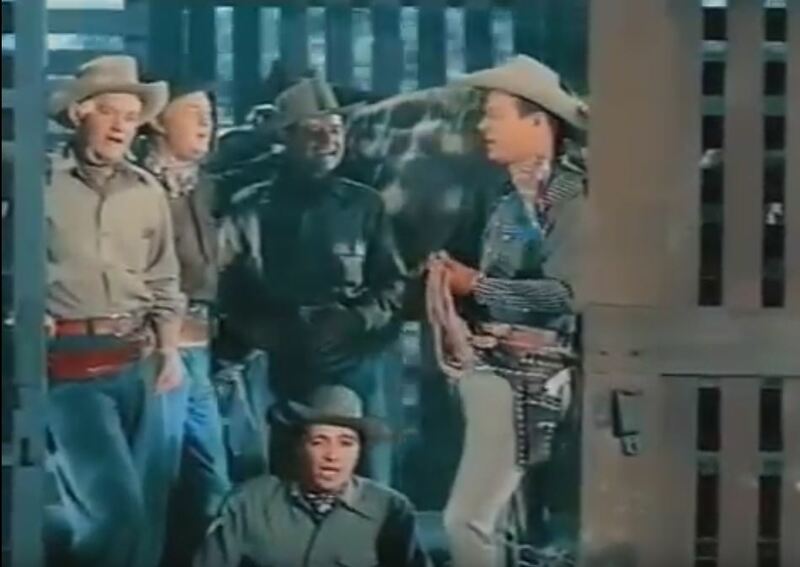 Meanwhile, Roy, Trigger and the boys (The Riders of the Purple Sage) engage in a little harmonizing as they wait to load up their cattle; Yonder comes the train. 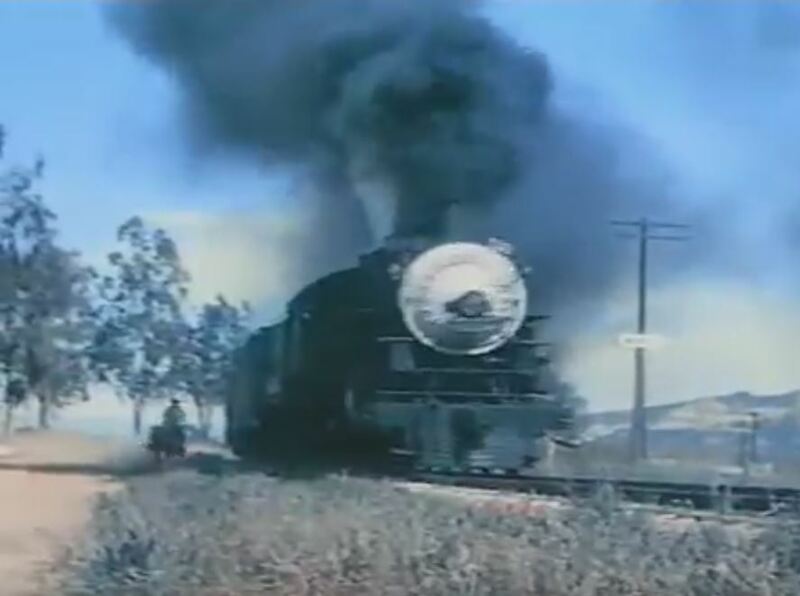 Spewing black smoke, SP 1503 comes roaring up the track; Trigger looks on in amazement as the train hurries by — without making its scheduled stop. Suspicious, Roy and Trigger take off after the speeding SP 1503. 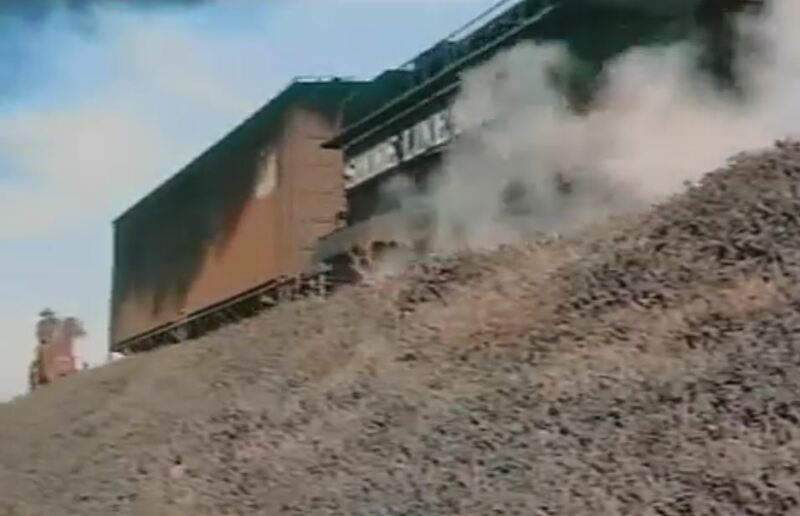 As he attempts to board the cab, the bad guy engineer pushes Roy off, where he tumbles down the steep embankment — keeping his cowboy hat ON the whole time! 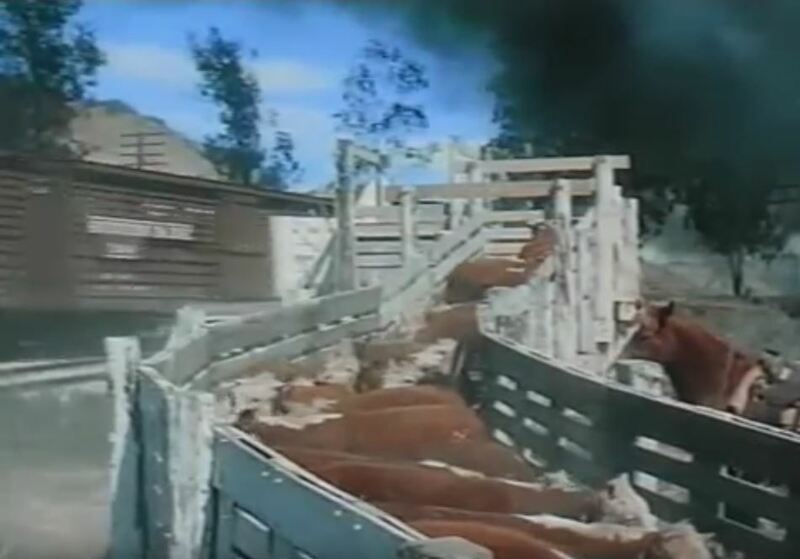 Roy and the boys manage to rustle up another train of stock cars to move their cattle; After climbing down from the cab of SP 3476, Roy jumps up into an empty stock car with the rest of the boys. More harmonizing as the train trundles furiously along. Lots and LOTS of plot left off. Time for the finale! 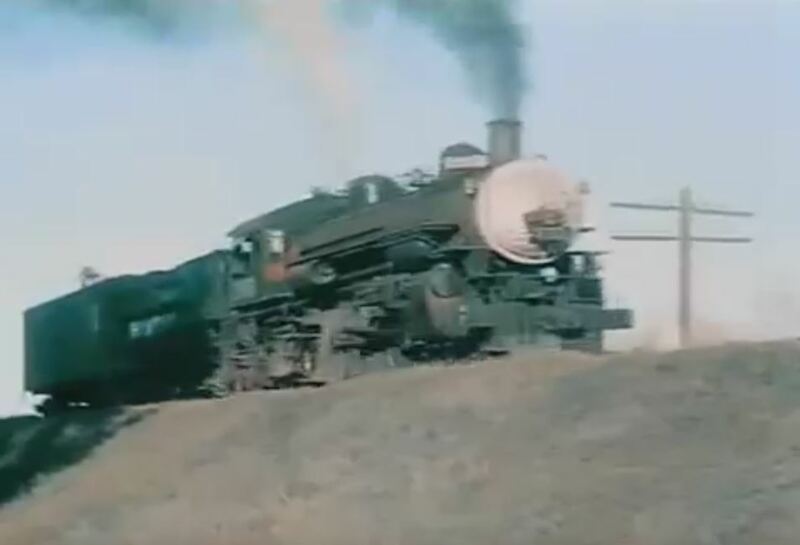 This time the gun runners have commandeered SP 2651 and back it down onto PFE 75119 with its load of guns and ammo. 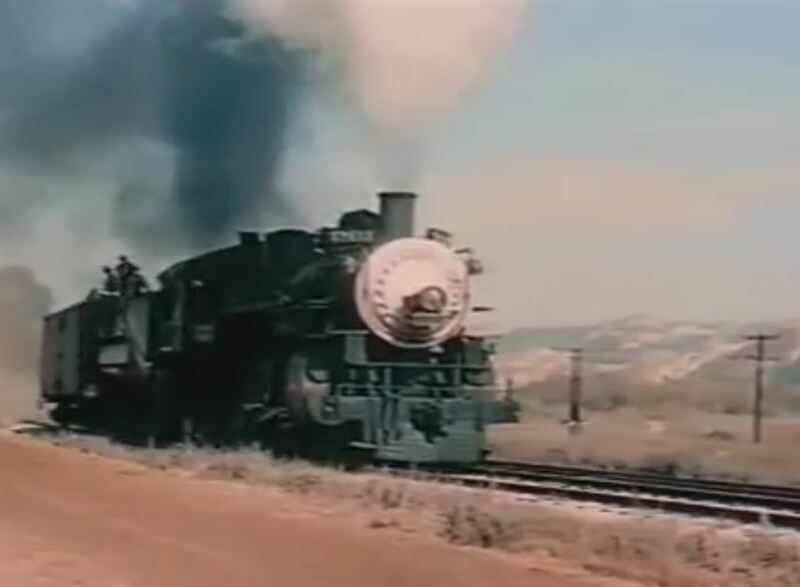 SP 2651 races along with its cab full of bad guys. But all is not lost. 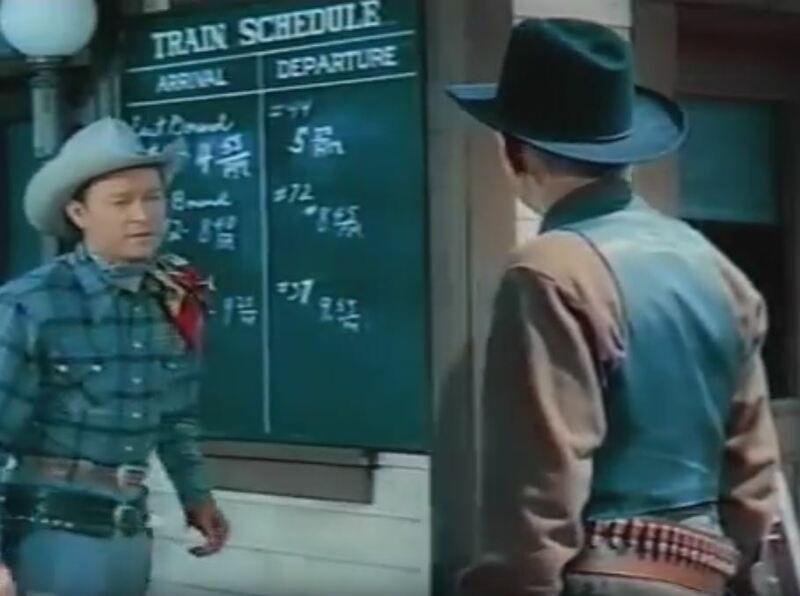 Roy knows the schedule (posted conveniently behind him), rounds up a posse and sets off after the gun smugglers. 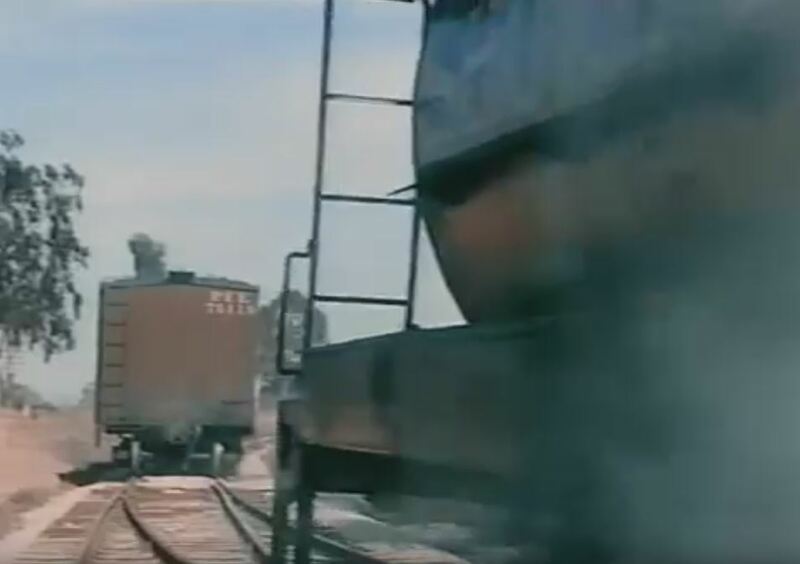 The 2651 slows to a stop and the gang prepares to unload the freight car. Notice the ice bunker hatches are open at the four corners of the car roof. Unloading the rifles; Good view of the folding-open doors of PFE 75119. In the background comes Roy and the posse. Shoot out! Notice the carefully painted out Southern Pacific Lines and Union Pacific logos on the reefer. Also notice the ice bunker hatches are now closed! 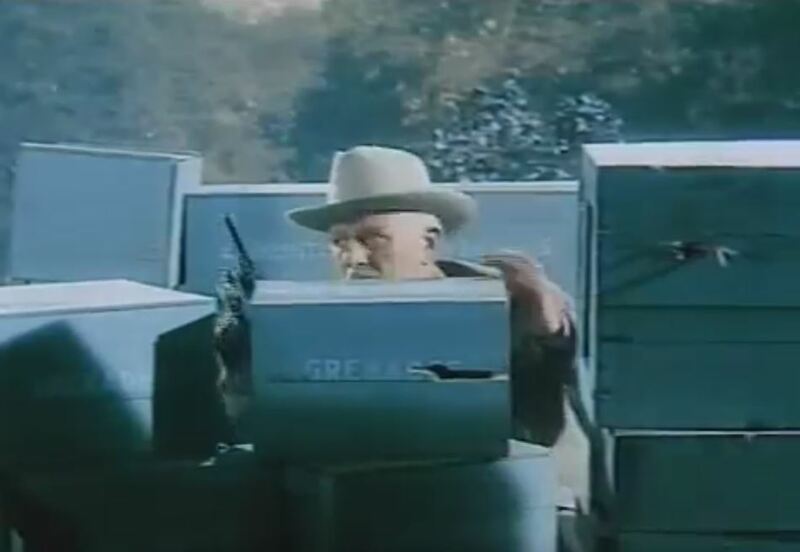 Bad guy hiding behind a box of grenades. This is almost NEVER a good idea in a gunfight; BOOM! Sure enough — scratch one henchman. 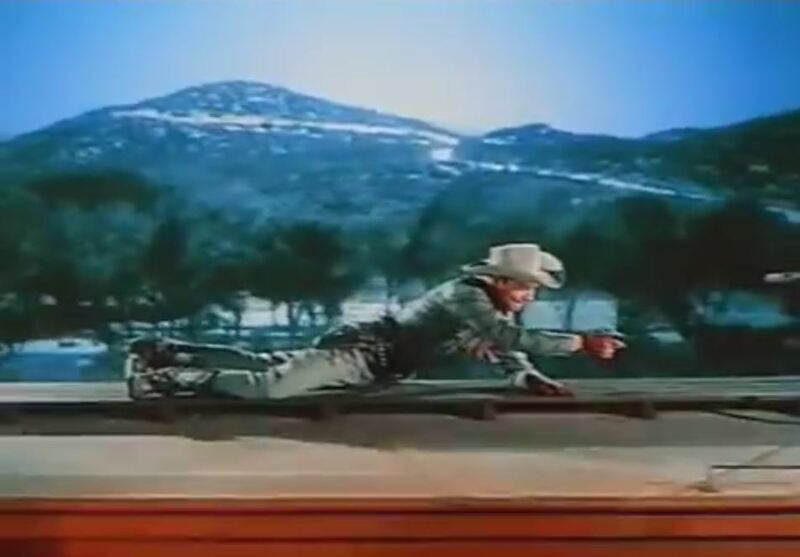 Roy clambers over the top of PFE 75119; From a prone position, Roy shoots it out with the bad guy. Roy and Trigger make the local paper as our story ends. 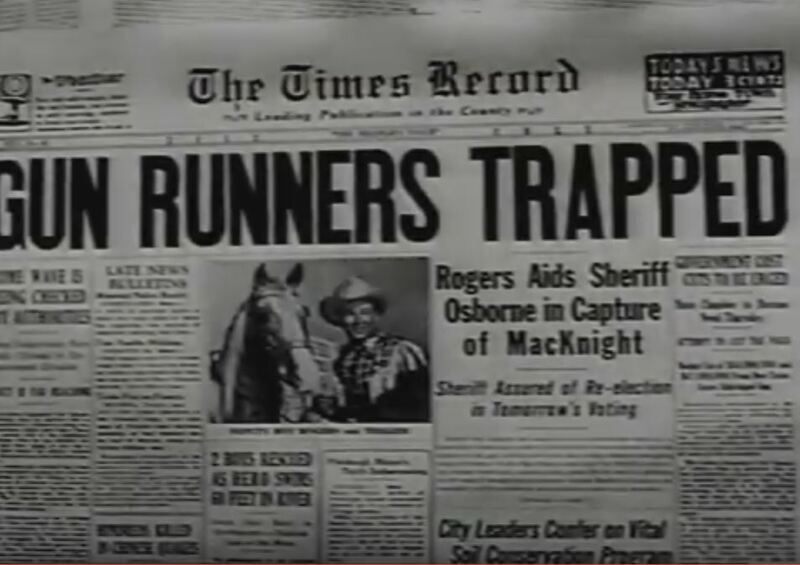 Meanwhile, City Leaders confer on vital soil conservation program! 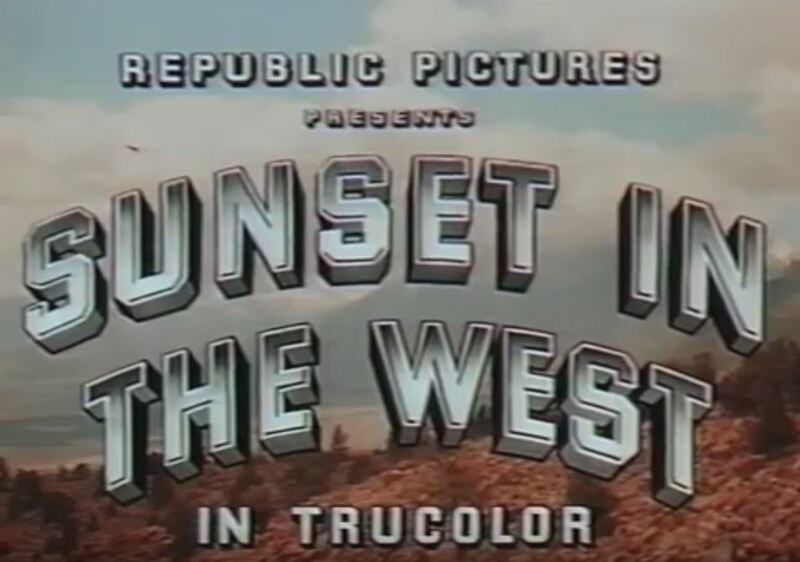 This entry was posted in Uncategorized and tagged Pacific Fruit Express, Republic Pictures, Riders of the Purple Sage, Roy Rogers, Southern Pacific Railroad, Steam Locomotive, Trigger, Western movie. Bookmark the permalink.